Yesterday we covered the graphics hardware needed to handle Beryl (GPUs & Beryl: What is Needed?) and on the heels of that article we are taking a quick look at another Linux versus Windows comparison for the official ATI/AMD graphics drivers. NVIDIA's Linux and Windows drivers perform about the same and in some instances the Linux binary driver even running faster, but as we have been sharing now for many months the Linux fglrx driver is handicapped for performance. Has things since improved for ATI? Well, as you'll see in this article by using the official Linux driver from ATI/AMD you can expect your frame-rate to be cut in half compared to the most recent version of the Windows Catalyst driver. 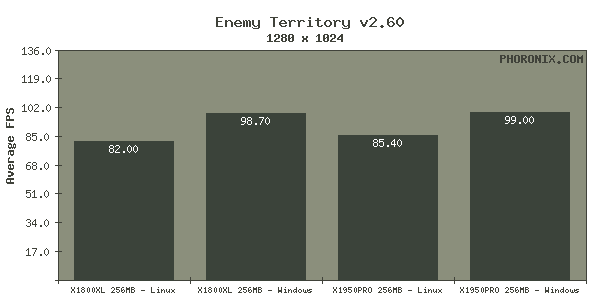 It's been a few months since we last did any Linux versus Windows performance comparison and for this we had tested both an ATI Radeon X1800XL 256MB and ATI Radeon X1950PRO 256MB under Microsoft Windows XP Professional w/ Service Pack 2 (32-bit) and Ubuntu 7.04 Feisty Fawn (32-bit). The drivers used was the Catalyst 7.4 release for Windows and the AMD fglrx 8.36.5 release for Linux. 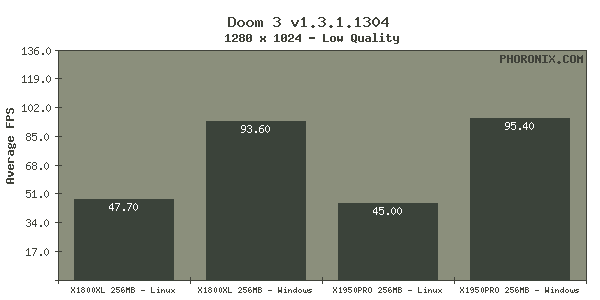 The benchmarks we had used were Enemy Territory, Doom 3, and Quake 4 as they all have quality Windows and Linux builds. Comprising the rest of the system was a Tyan Tempest i5000XT motherboard, dual Intel Clovertown E5320 processors (dual quad-core Xeon CPUs), 4GB of DDR2-533 FB-DIMM, 80GB Seagate 7200.10 hard drive, and SilverStone Olympia 750W power supply. Without further ado, on this page and next are our results from this short US Memorial Day special.